“We hope that in the coming months we will work more actively to search for the ways of settling the Karabakh conflict,” Le Drian said on May 27 during a joint news conference with his Azerbaijani counterpart in Baku, as quoted by Radio Free Europe/Radio Liberty. “France, as co-chair of the OSCE Minsk Group, will make the necessary efforts for a peaceful settlement of the Armenia-Azerbaijan Nagorno-Karabakh conflict, and we believe that it is necessary to improve the work of the OSCE in this regard”, he said, as quoted by Trend agency of Azerbaijan. Azerbaijan’s foreign minister Elmar Mammadyarov told reporters that he and Le Drian had held substantive discussions on the issue. “We adhere to the strategy of resolving the conflict peacefully, and I am sure that France as co-chair of the OSCE Minsk Group will continue to help resolve this situation,” Mammadyarov said. Le Drian is on a tour of the South Caucasus and is scheduled to hold talks in Yerevan, the Armenian capital, on 28 May. In Tbilisi, Baku and Yerevan, the minister for Europe and foreign affairs will take part in the commemorations of the three republics’ declarations of independence in 1918, the French foreign ministry had announced. Nagorno-Karabakh and seven adjacent regions are internationally recognized territories of Azerbaijan but have been occupied by Armenia following a 1988-94 war that claimed an estimated 30,000 lives and displaced hundreds of thousands of people. A cease-fire was called in 1994, but decades of internationally mediated negotiations with the involvement of the OSCE’s Minsk Group have failed to result in a resolution. The Minsk Group is co-chaired by France, Russia, and the United States. 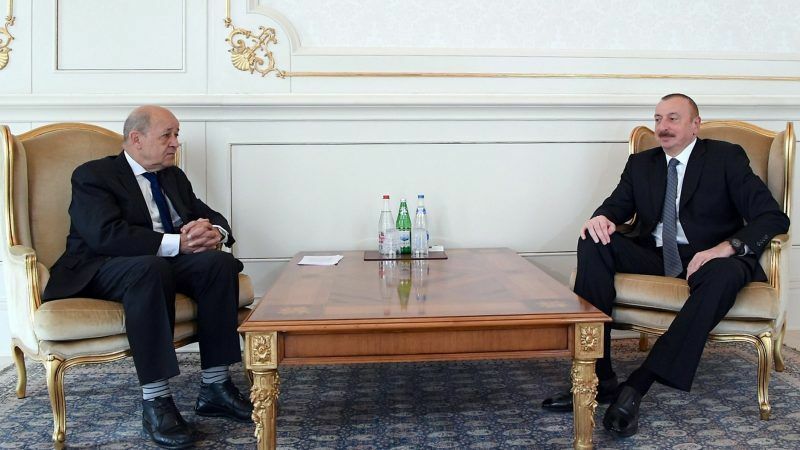 Le Drian also met with Azerbaijani President Ilham Aliyev, with Aliyev’s press service saying that along with the Karabakh issue, energy cooperation between Paris and Baku was also discussed. Aliyev is scheduled to visit Paris in July, and Le Drian said French President Emmanuel Macron will visit Azerbaijan by the end of the year but did not provide more details.